The recently released White Paper entitled “Assessing and Anticipating Threats to US Security Interests: A Bio-Psycho-Social Science Approach for Understanding the Emergence of and Mitigating Violence and Terrorism” that Giordano discusses in the succeeding section provided a scientific perspective on current operations. The current White Paper provides operational perspectives on that and other relevant sciences. Previous versions outlined WHAT scientific approaches might be relevant; this iteration focuses on HOW to operationalize it. The volume is focused primary on Military Information Support Operations (MISO), formerly Psychological Operations (PSYOP) as it is the activity that can most benefit from (and reciprocally impact) cognitive engagement. However, IO core capabilities such as Military Deception (MILDEC) and Computer Network Operations (CNO) information related capabilities such as counterintelligence (CI) could also benefit from bio-psycho-social applications to cognitive engagement. To paraphrase Sir Basil Henry Liddell Hart, targeting the mind of the enemy commander is more important than the bodies of his troops (Hart, 1967), that recommendation can be extended to all those, belligerents and combatants alike, who comprise the human domain. The contemporary operating environment is growing increasingly contentious, however, the vast majority of those contentions do not necessarily require the use of lethal force. Instead, nuanced understanding of the nature of conflict and the peoples engaged are required to remain competitive. Cognitive engagement entails understanding the individual nodes with the human domain as such and developing appropriate methods for interacting with them. 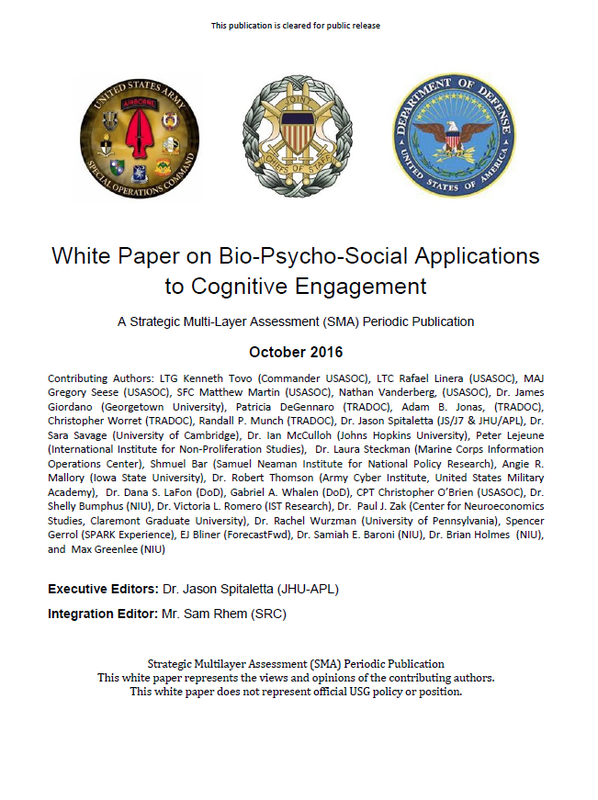 This White Paper is meant not only to continue the dialogue between the academic and operational communities but also to explore more deeply how to apply knowledge gained through bio-psycho-social research to cognitive engagement. The idea of cognitive engagement comes from the discussion of the Gray Zone or times when nations compete with each other in everything except direct state on state war. During this time, nations can use diplomatic, information, military and economic (DIME) ways to purse statecraft. This spreads through the gambit of combined arms maneuver, clandestine intelligence operations, robust diplomatic tactics, political and operational warfare to building partnership capacity. The challenge with ambiguous engagement is in order to have a high success rate at countering or anticipating action it is essential to enforce cohesive inter-agency cooperation, align missions across U.S. international and foreign policy tools, and understand how and when to use resources, in the military, conducting operations other than traditional war to support American interests. The military is currently the most dominant tool in U.S. policy. However, if the military is not trained and prepared to conduct campaigns other than war, its power wanes. This paper will look at how the military can operate in this ambiguous engagement environment primarily to support U.S. interests focusing more in DIME with a more prominent “I” (information) or the information environment (IE).